Versatile Scoop: Pastor Preaches Chris Brown's Lyrics! Pastor Preaches Chris Brown's Lyrics! A pastor raised eyebrows last weekend when he inserted a popular hip hop lyrics into his "empowering" sermon at the Empowerment Temple in Baltimore. Ministers are much younger these days and are more in touch with pop culture and secular music, but this pastor may have crossed the line during his sermon. It’s obvious the congregation didn’t take issue with his use of the derogatory term, since they all cheered loudly. But Bryant didn’t stop there. He went on to talk about baby mamas etc. Who knows, maybe Bryant is as hard on himself as he is with the members of his congregation. Bryant has had his own fair share of scandals. Bryant admitted to having an extramarital affair while he was married, which ultimately led to his divorce. 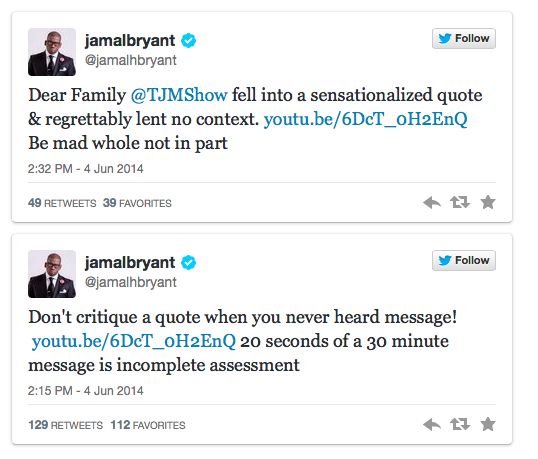 Bryant came to his own defence on Twitter this morning, claiming that many people didn’t get the full context of his sermon, and shared a link to the sermon.